• Pembroke Welsh Corgi dog breeders are listed below alphabetically by State / city. 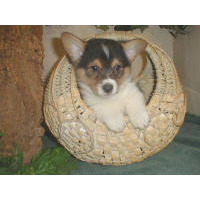 • Click on underlined words to Pembroke Welsh Corgi puppies for sale. • Please tell the Pembroke Welsh Corgi breeders with puppies for sale that you found them on BreedersClub.net. Pembroke Welsh Corgis are built low to the ground, strong and excellent herders. 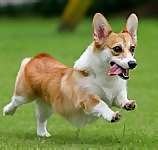 Its body is shorter with lighter boned legs than the Cardigan Welsh Corgi. Given good amounts of exercise, Pembrokes can do well as family dogs in both urban and country environments. AKC categorizes this breed in the Herding Group. I raise my puppies in a country setting and they get lots and love and attention by myself and my grandchildren so they are well socialized. I have been raising puppies for over 15 years. They are AKC registered, are given all their first vaccinations and wormings and are vet checked before they go to their forever homes. I also provide a 1 yr guarantee against genetic defects. I do ship at buyers expense. You can call or e-mail me about my puppies and I will be happy to provide any additional information and pictures of the puppies. This breed directory page features Pembroke Welsh Corgi dog breeders with puppies and/or adult dogs for sale. Once you purchase your new found friend, you will want to provide it the best in pet health care. Be sure to visit our online discount pet supplies catalog and order NuVet Plus™ to keep your puppy and adult dogs in top condition. The discount catalog also features collars, leashes, carriers, general pet care products and much more. BreedersClub.net does not pre-screen the Pembroke Welsh Corgi dog breeders who advertise their puppies and dogs for sale in the BreedersClub.net breeder directory and in the classified ads. We require all advertisers to agree to our advertising terms. You should ask the Pembroke Welsh Corgi dog breeders you talk with for references from past buyers and veterinarians.